Ald. Brian Miller (9th) attends a council meeting. One of Miller's supporters unsuccessfully challenged the candidacies of two of his opponents based on a 1992 citywide referendum mandating a mayoral primary. With five candidates officially in the running for both mayor and Fifth Ward alderman, Evanston will hold a primary in February ahead of April’s general election, the city announced Friday. The announcement from City Clerk Rodney Greene’s office comes on the heels of a contentious period early in the election season, after a supporter of mayoral candidate Ald. Brian Miller (9th) challenged the bids of three of his opponents. 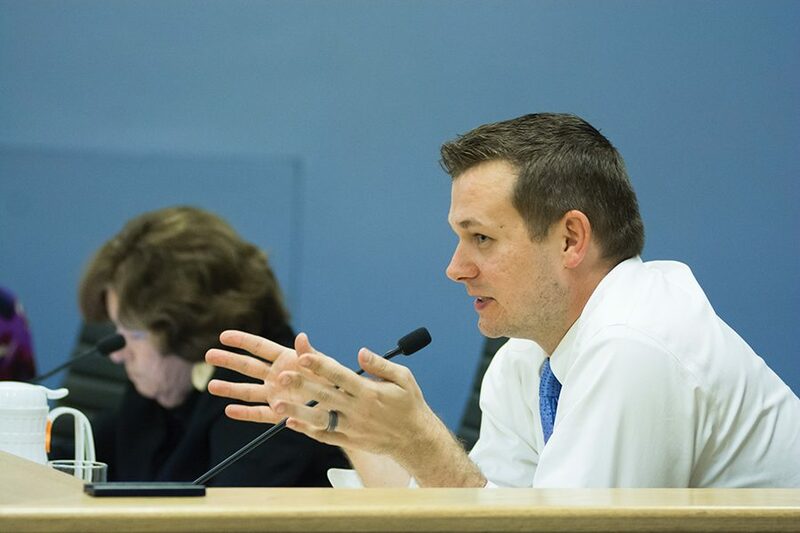 The challenger, Evanston resident William Arndt, argued candidates Ald. Mark Tendam (6th), businessman Steve Hagerty and former Evanston Township supervisor Gary Gaspard neglected to indicate the primary date of Feb. 28 on their election petitions. The charge against Tendam was withdrawn, and the other two dismissed by the city’s electoral board. The primary is a result of a 1992 citywide referendum, which calls for a mayoral election ahead of April’s consolidated general if more than two candidates file. After that primary, the top two candidates run in the general election, according to reporting from The Daily after the referendum was passed. If one candidate wins more than 50 percent of the primary vote, they win the entire mayoral election, the referendum said. In a statement released last week, Miller said after he realized Evanston wasn’t properly implementing the 1992 referendum, he spoke with election law experts and city officials on the matter. “Elected officials need to follow the law in every instance, especially when our own citizens voted to create that law,” Miller said in the statement. Ald. Ann Rainey (8th) asked Arndt’s lawyers at an electoral board hearing last week if they could tell her how many primaries had been held in Evanston after the 1992 referendum. One of Arndt’s lawyers replied that he was not aware. Also on the ticket for the February primary is NU alumnus and Evanston resident Jeff Smith (WCAS ‘77), along with five candidates to replace retiring Ald. Delores Holmes (5th). Only mayoral and Fifth Ward aldermanic candidates will appear on the February ballot, Greene said in the announcement.